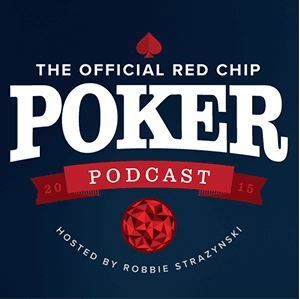 Playing from the blinds is probably one of the hardest things in poker. 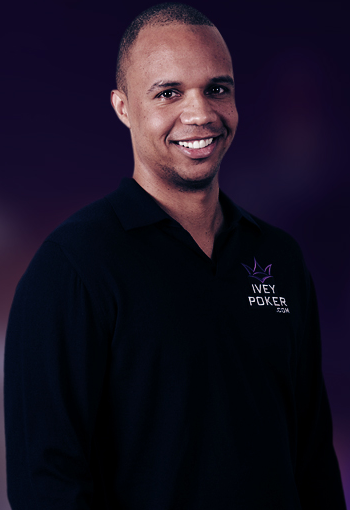 You’re forced to put money in, you’re always out of the position, and, on average, you’ll have a rather weak hand. All of this combined makes blind play a rather difficult matter. 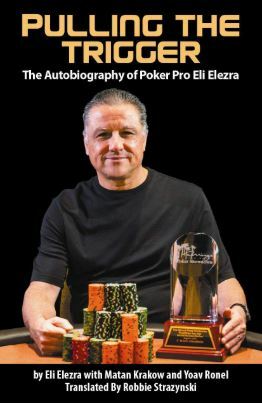 However, since there is no way around this if you want to play Texas Hold’em (we all have to post blinds, after all), learning strategies and techniques to minimize our losses is essential to our poker success. 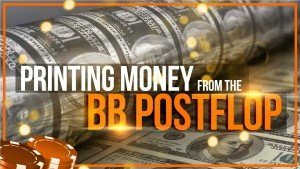 That’s why I found the Printing Money from the BB Post-Flop course by MyPokerCoaching rather intriguing and decided to give see what it was all about. 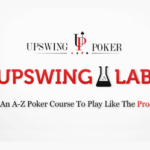 The course consists of two parts, with both parts focused on playing from the big blind (as the name suggests). 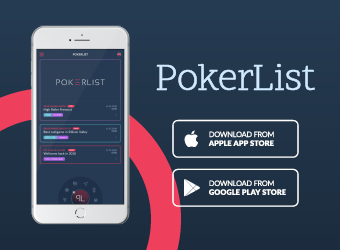 The first part deals with pots where the original raiser (button) doesn’t c-bet, while the second part deals with situations where we’re facing a c-bet. 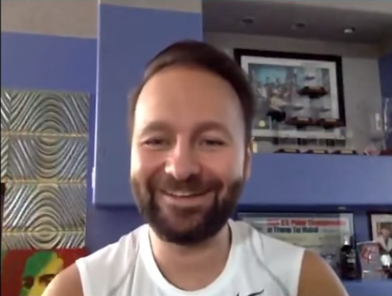 This is a natural and intuitive way to split the topic, so it certainly gave me the confidence that the course on the whole could be really useful. Before moving on to the course’s title topic, the first video first tackles the big blind problem at large. A good point the instructor makes is that playing from the big blind is always going to be a losing proposition, so that’s something to come to terms with. This is a good distinction to make, especially for less experienced players, who might be feeling bad about losing from the blinds. As stated, while no one wins from the blinds, our goal should be to minimize the loss, which would naturally be one big blind every time it is our turn to post. Reducing this amount even by 10% or 20% should already be considered a success. So, again, have reasonable expectations here: your goal is simply to reduce losses as much as possible. 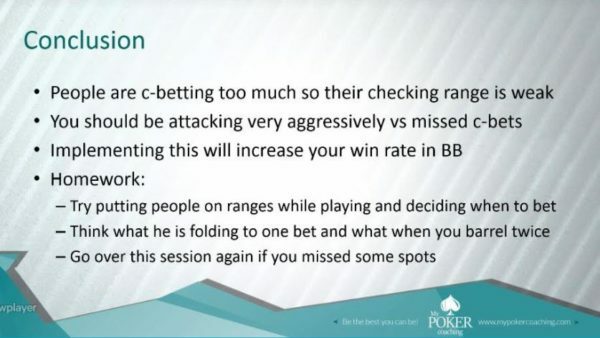 This introductory part then goes on to deal with some general considerations about big blind play, such as the fact that button opens are usually fairly wide and that we need to defend around 67% of the time to make it unprofitable for them to raise every time we are in the big blind. I must admit being quite surprised to discover that the percentage was that high. That, too, is definitely something to keep in mind, as it is probably fair to say it doesn’t come naturally to too many players. Although I found it a bit strange that the first part was going to deal with the missed c-bets, truthfully speaking, the order of the topics isn’t that relevant as long as all important information is covered. 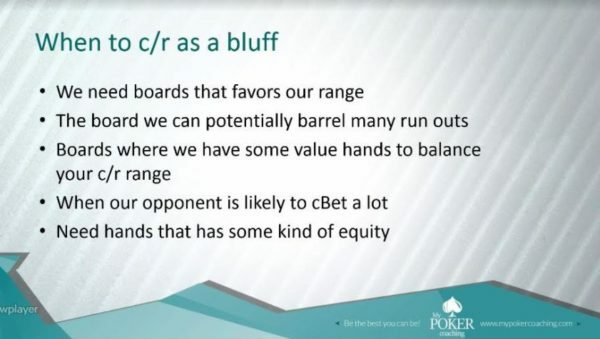 This part of the course is introduced by emphasizing that if we’re going to defend wide from the big blind, it only makes sense if we’re going to continue fairly wide after the flop. 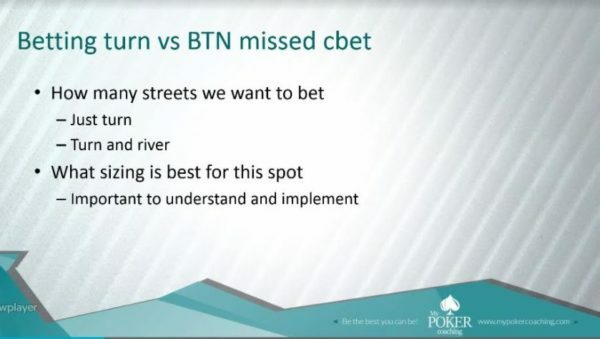 The instructor then proceeds to explain that we have ample reasons to attack missed c-bets because, as a general rule, people c-bet too much. This means that, in most cases, a skipped continuation bet indicates weakness. It is essential to keep these things in mind when planning your turn play against a missed c-bet. The instructor then goes on to give several examples of different boards and various turn and river cards, explaining the reasoning behind correct decisions based on these considerations. The examples provided are really detailed and well-explained and it’s suggested (both by the instructor and by me!) that you take the time to analyze them on your own. 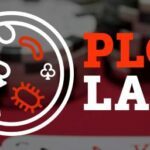 The topic is certainly covered well and it opens a lot of ideas to think about when planning for your play from the big blind. 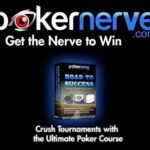 The second part of the course deals with probably more frequent situations, which is when we are facing a c-bet when defending from the big blind. This part also begins with some general considerations, discussing the fact we need to defend wide and continue wide, but how far should we go when our opponent has shown the interest in the pot? 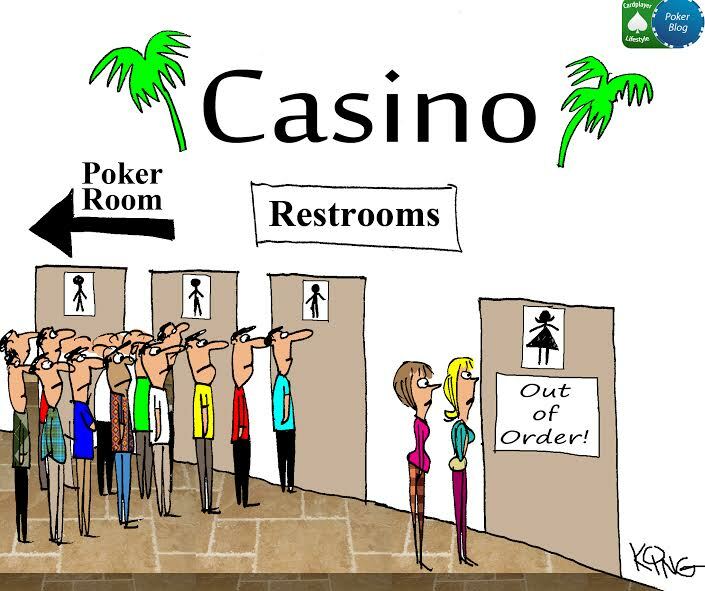 An important thing emphasized right at the start is that playing fit-or-fold poker will not work. If we give up every time we miss, we’ll be giving our opponents too much of an edge. 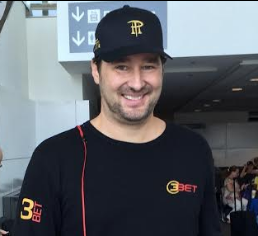 Secondly, as already mentioned, people tend to c-bet too much, which is something we need to be taking advantage of. 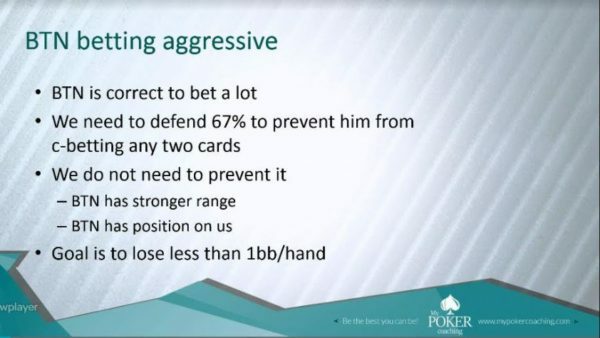 A part of the video that I found really helpful is the one explaining the math behind a check-raise and how, with proper bet sizing, you only need your opponents to fold just 51% of the time to make it work – even without accounting for the times when you do have a good hand or catch up on the turn and the river. Like in the first part, there are several examples explaining these various concepts, explaining how and why they work. These examples consider our holdings, board texture, opponent’s perecieved range, etc. 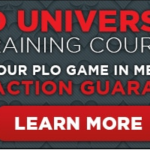 In total, MyPoker Coaching’s Printing Money from the Big Blind Post-Flop course lasts about 90 minutes and it offers some invaluable insights into the big blind play and various ways to reduce your losses when in the blinds. 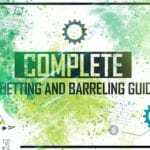 It gives some very solid advice based on the numbers and calculations, but it also considers some general trends and tendencies in the game that you can take advantage of. 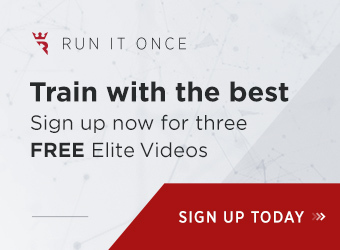 For anyone looking to improve this segment of their play, this course is well worth the money and the time, but you’ll be have to be ready to do some “homework” assigned by the author. If you follow the instructions from the video and do the work, however, you’re guaranteed to see some significant improvements in this area of your play.